PASADENA, Calif. — NASA’s Mars Reconnaissance Orbiter has provided images allowing scientists for the first time to create a 3-D reconstruction of ancient water channels below the Martian surface. The findings are reported in the March 7 issue of Science Express by a team of scientists from NASA, the Smithsonian Institution in Washington, and the Southwest Research Institute in Houston. 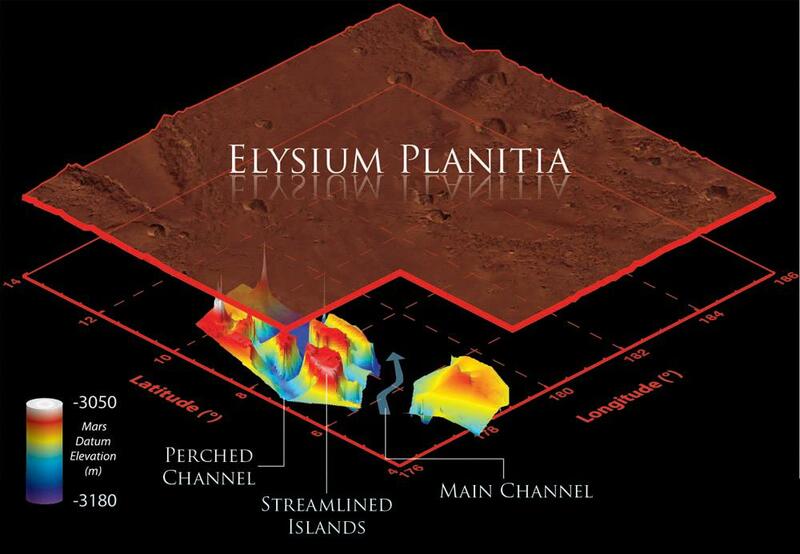 The channels lie in Elysium Planitia, an expanse of plains along the Martian equator and the youngest volcanic region on the planet. Extensive volcanism throughout the last several hundred million years covered most of the surface of Elysium Planitia, and this buried evidence of Mars’ older geologic history, including the source and most of the length of the 620-mile-long (1000-kilometer-long) Marte Vallis channel system. To probe the length, width and depth of these underground channels, the researchers used the Mars Reconnaissance Orbiter’s Shallow Radar (SHARAD). Marte Vallis’ morphology is similar to more ancient channel systems on Mars, especially those of the Chryse basin. 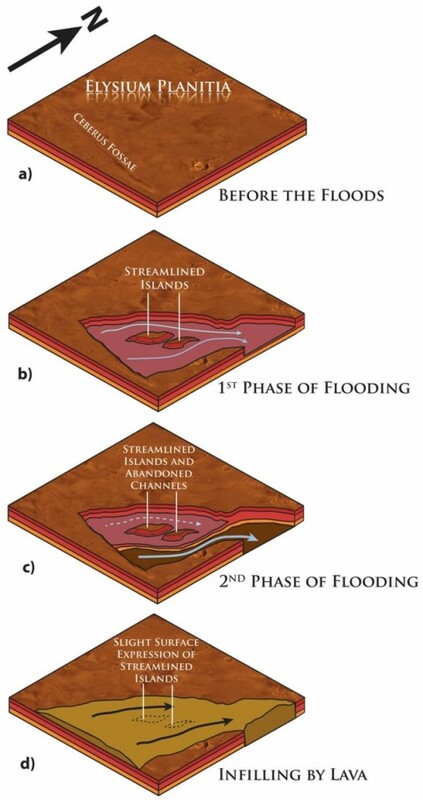 Many scientists think the Chryse channels likely were formed by the catastrophic release of ground water, although others suggest lava can produce many of the same features. In comparison, little is known about Marte Vallis. With the SHARAD radar, the team was able to map the buried channels in three dimensions with enough detail to see evidence suggesting two different phases of channel formation. One phase etched a series of smaller branching, or “anastomosing,” channels that are now on a raised “bench” next to the main channel. These smaller channels flowed around four streamlined islands. A second phase carved the deep, wide channels. “While the radar was probing thick layers of dry, solid rock, it provided us with unique information about the recent history of water in a key region of Mars,” said co-author Jeffrey Plaut of NASA’s Jet Propulsion Laboratory, Pasadena, Calif. The Italian Space Agency provided the SHARAD instrument on Mars Reconnaissance Orbiter and Sapienza University of Rome leads its operations. JPL, a division of the California Institute of Technology in Pasadena, manages the mission for NASA’s Science Mission Directorate in Washington. Lockheed Martin Space Systems of Denver built the orbiter and supports its operations.